Mexico, the land of vibrant culture, enigmatic civilization and diverse ethnics is located in the southern part of North America in the western hemisphere. Its official name is United Mexican States. It is politically divided into thirty one sovereign and free states. It covers a total area of 1,972,550 sq. km making it the fourteenth largest country of the world. It is bordered by USA in the north, Guatemala and Belize in the south, Pacific Ocean in the west, Caribbean Sea in the south east and the Gulf of Mexico in the east. Mexico has 9,330 km long coastline. Mexico City, the capital and largest city of the country is also an important financial center of the North American continent. Economically the country is strongly places in the world. 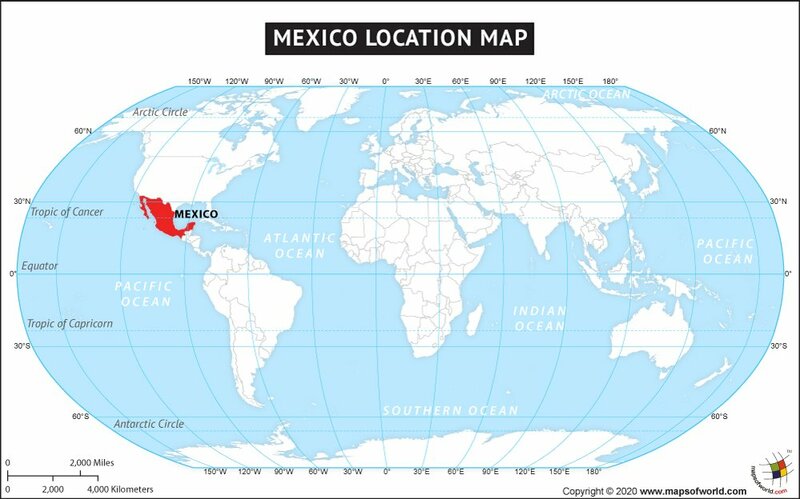 The geographic coordinates of Mexico are 23 00 N, 102 00 W.
Mexico enjoys varied temperature from desert to tropical mainly due to the presence of Tropic of Cancer, which divided the country into tropical and temperate zones. Mexico is one of the mega bio-diverse countries of the world. It also has diverse landscape from high mountain ranges to low lying plains, plateaus and deserts. Mexico is the sixth ranked country in the world with maximum number of UNESCO World Heritage sites.